The Nexus 4 in both 8GB and 16GB variants has been sold out in the U.S. (potentially the globe too) for what seems like an eternity. LG doesn’t think there are supply issues, Google clearly does. All I know is that there are more than a handful of Android enthusiasts who want this phone and have had no chance to pick it up. Well, unless they want to pay out top dollar. Take this listing on Amazon for example. 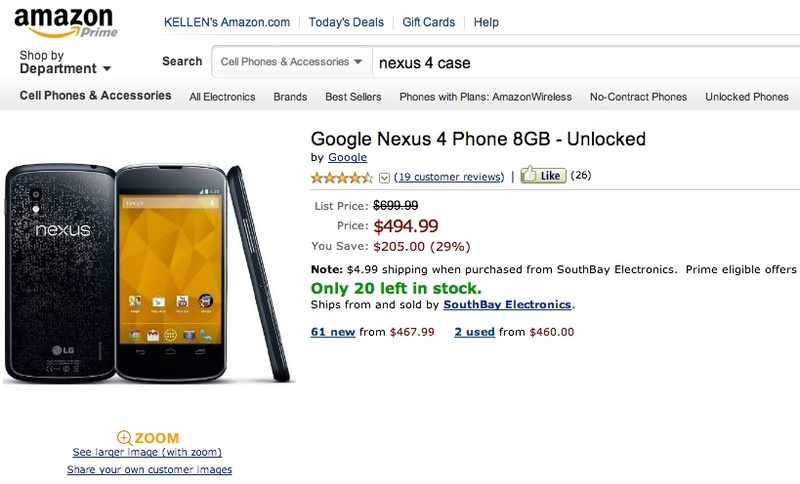 The 8GB version, which normally runs $299 from Google, can be had for $494.99. I don’t think I need to do the math here, do I? If you are desperate though, you better hurry as they only have 20 or so in stock. Or as some have pointed out, you may want to check your local T-Mobile store.